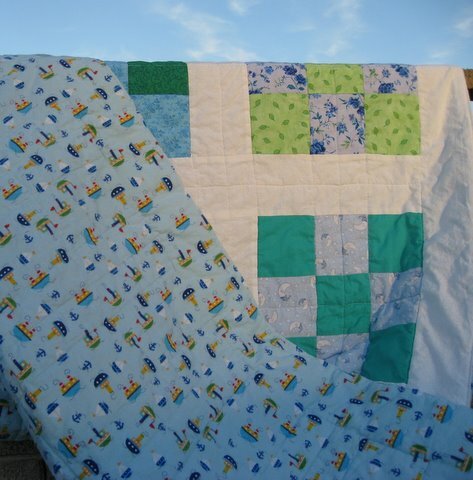 Here’s the second baby quilt for Maggie’s House that I delivered on Christmas Day. I forgot about taking a picture until the last moments before the sun dipped below the neighbors’ house, and even then half ended up in shadow with the rest tinged in pinkish golden sunset light. 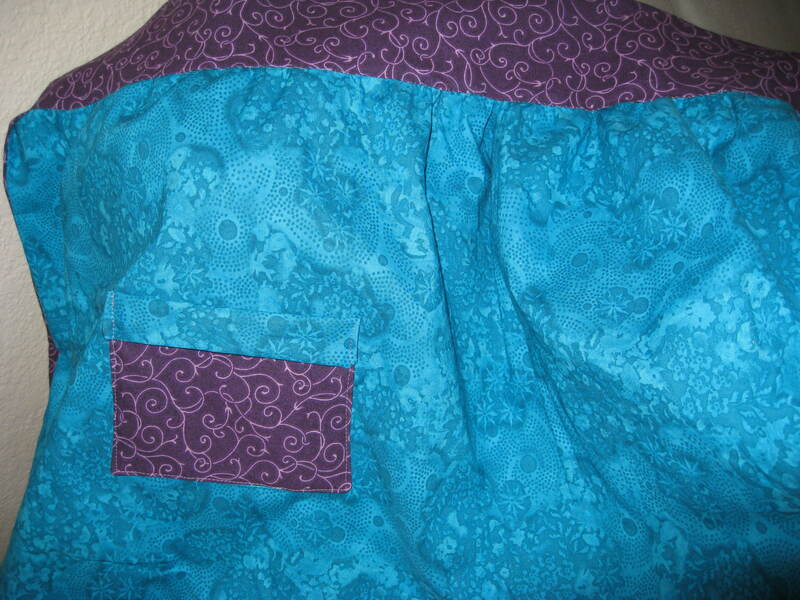 I quilted it in straight lines, mostly stitch-in-the-ditch using the nine patch seams, plus extra quilted lines in the middle of each block and through the sashing. The back is a soft flannel in a sailboat print. 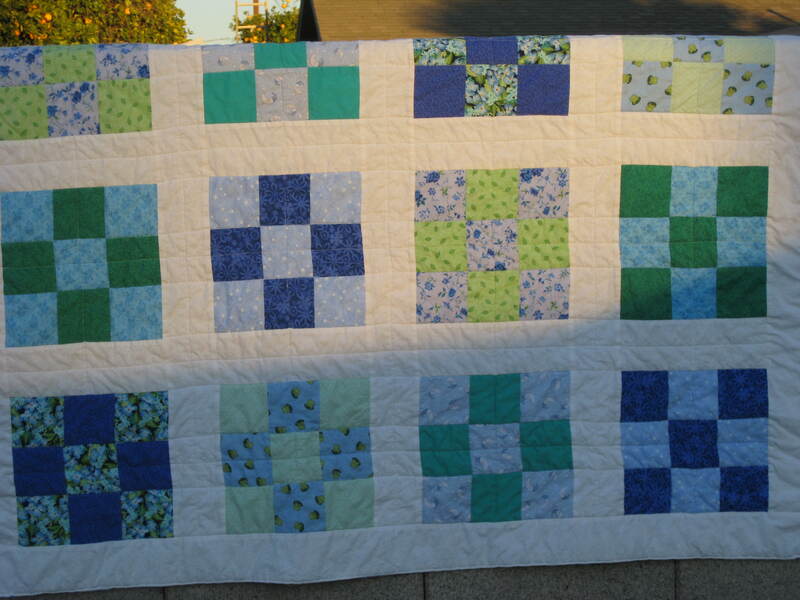 It’s my first quilt using white sashing, which looks so lovely in all kinds of other quilts I’ve seen and yet I dunno, I think I prefer the intensity of pure colors. I used a tiny white-on-white floral print instead of strictly white, a detail that I like in person which doesn’t show up in this quality of photo. December 26, 2009. 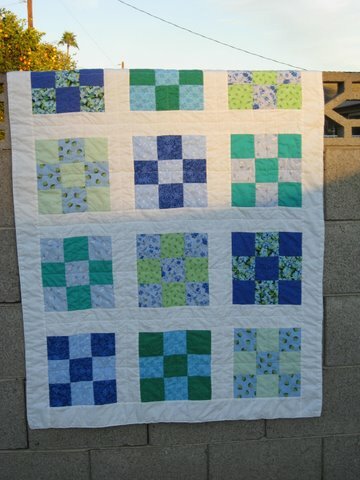 Tags: baby quilt, blue & green, completed project, quilt. Pictures, Projects, Words. 1 comment. I won the Confessions of a Sewing Dork contest, thanks to the two pound bag of croutons sitting on my mantle for 18 months. I wrapped them up in pretty paper and gave them to a friend as Hanukkah gift #8. My prize came in the mail a few weeks ago and it was a sweet surprise to see a real package in my mailbox when I got home from work. 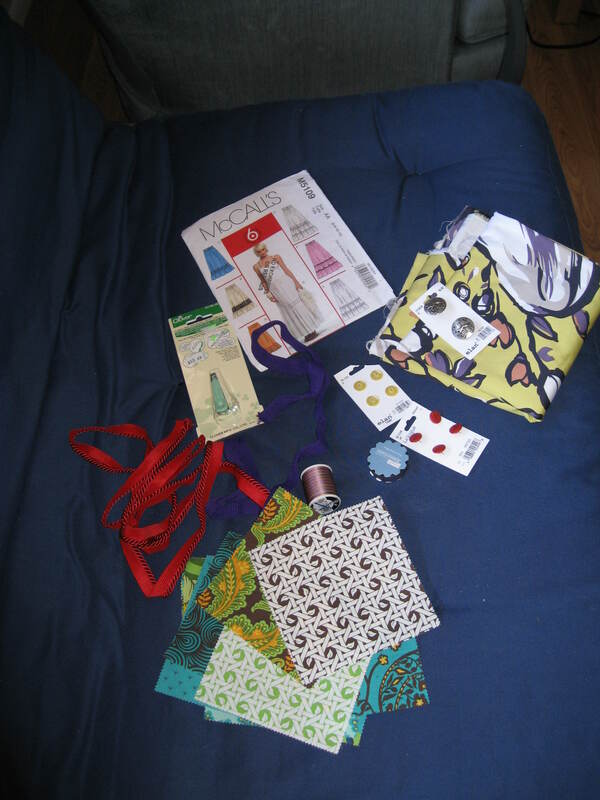 The loot includes red piping trim, pre-cut squares, buttons, a pattern, and a piece of fabric in an astounding chartreuse color that just isn’t done justice in the picture. Thank you! December 20, 2009. Tags: giveaway. Pictures, Words. 2 comments. December 19, 2009. 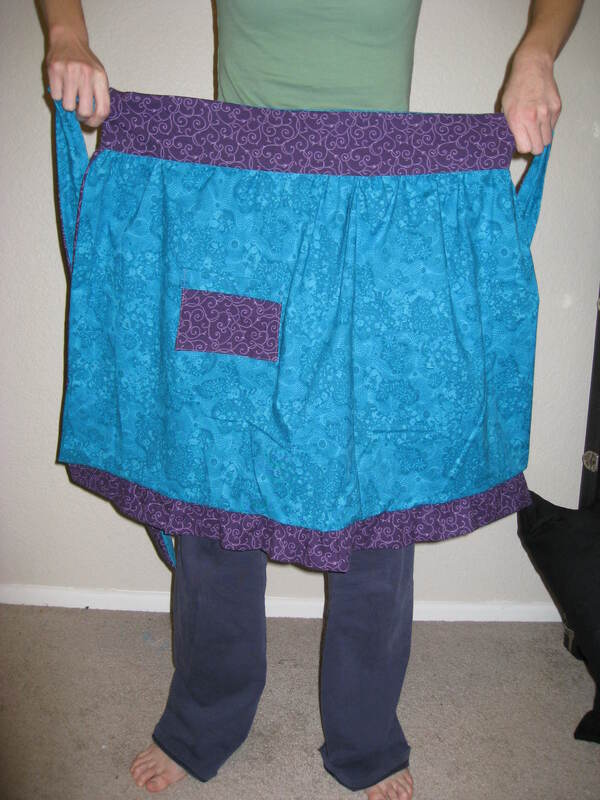 Tags: apron, completed project, swap. Pictures, Projects, Words. 1 comment. 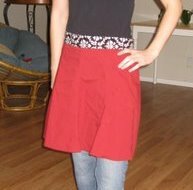 The apron I decided to keep for myself has a classy black & white waistband that I realized afterward that I cut with the pattern sideways, and the one for my mom has a waistband featuring chickens. It’s the same fabric I used to make her Chickens II quilt later, actually. December 18, 2009. 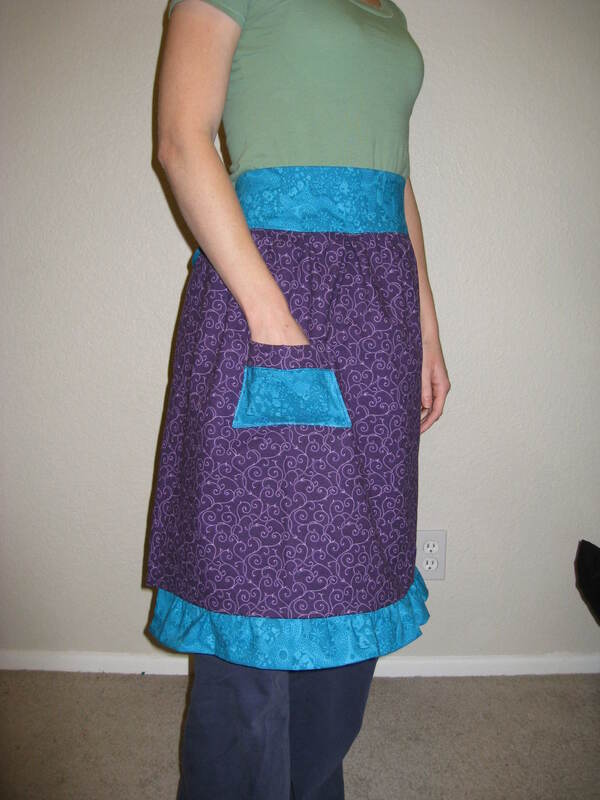 Tags: apron, completed project, refashion. Pictures, Projects, Words. 2 comments. I hosted a party on Friday with guests wearing their best Festive Holiday Attire. 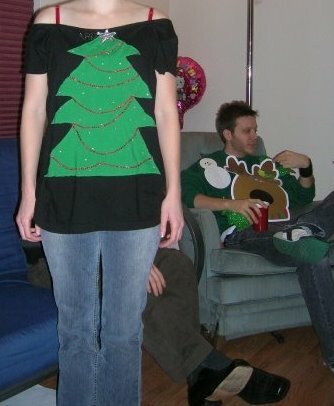 Some went the tacky route, as I did with my homemade Christmas tree off-the-shoulder shirt above complete with red beaded garland (it was tackier with the giant fake poinsettia flower brooch that kept falling off), while others were classy in a cocktail dress or button-down shirt. One person came in costume as a member of the nativity scene, another wore red plaid pajamas, and there were a few Christmas sweaters. We ate cookies and played holiday Pictionary, enjoying ourselves into the night. December 13, 2009. 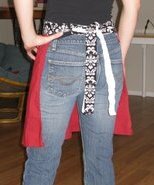 Tags: clothes, completed project, refashion. Pictures, Projects, Words. 2 comments.